Reform, or Revolution against Corporate Capitalism? “It is right and necessary that all men should have work to do which is shall be worth doing, and be of itself pleasant to do; and which shall be done under such conditions as would make it neither overwearisome nor over-anxious.” — William Morris, ‘Art and Socialism’. I first read William Morris’s News from Nowhere, his future history of a ‘return’ to an idealized vision of a pre-capitalist society, part feudal, part agrarian socialism, when I was a teenager, and perhaps oddly, I also read it as a science fiction novel. Long dismissed by ‘purist’ Marxists as unworkable, in light of the fact that even the original socialist version of industrial society is no more viable than the capitalist one, perhaps it’s time to reconsider Morris’s allegedly utopian vision. And in any case, one can already see the outlines forming of some kind of small-scale, co-operative, community, small business type economy emerging on the back of the information technology revolution (minus all the corporate/state stuff of course) that has much in common with Morris’s vision. ‘All’ that remains be done is to get rid of corporate capitalism and its parasitic ruling political class. Along with many of his socialist and not so socialist peers, Morris was appalled at the destruction of England’s physical landscape and its cultural history by a rampaging Victorian capitalism and sought refuge in the idea of an earlier, simpler society, largely agrarian and crafts-based. In reality, Morris’s own business was decidedly small capitalist and of course, his customers were almost exclusively middle/upper class but then this reflected the nature of his age. Nevertheless, the nature of his company’s production (the Firm) was highly skilled and sustainable employing modern technology only where necessary. The range of skills involved were centuries old; woodworking, ceramics, weaving, dying, printing and traditional building techniques, the additions being the use of some machine tools, the emerging chemical industry and of course steam and electric power generation instead of muscle power. But even the production of power via steam or water was sustainable and self-sufficient, employing technologies that had been around for centuries. Small-scale sustainable enterprises was an absolute prerequisite for his vision of an alternative socialist economy. “I have thought the matter up and down and in and out, and I cannot for the life of me see how the great change which we long for can come otherwise than by disturbance and suffering of some kind… Can we escape that? I fear not. We are living…in an epoch where there is combat between commercialism, or the system reckless waste, and communism, or the system of neighbourly common sense. Can that combat be fought out… without loss and suffering? Plainly speaking I know it cannot.” — ‘What We Have to Look For’. “made attractive by the consciousness of usefullness… It is most certain that labour may be so arranged that no social relations could be more delightful than communion in hopeful work; love, friendship, family affection, might be quickened by it; joy increased, and grief lightened by it.” – ‘Why Not?’, Justice, April 12th, 1884. “besides turning out goods useful to the community, will provide for its own workers work light in duration, and not oppressive in kind, education in childhood and youth, serious occupation, amusing relaxation…leasure…beauty of surroundings, and the power of producing beauty which are sure to be claimed by those who have leasure, education and serious occupation.” — ‘A Factory as It Might Be’, May Morris II. “The manufacture of useless goods, whether harmful luxuries for the rich or disgraceful makeshifts for the poor, having come to an end, [we shall be] in possession of the machines once used for mere profit-grinding but now used for saving human labour.” — ‘A Factory as It Might Be’, May Morris II. Is this not the vision of a sustainable alternative to the madness, the irrationality of corporate capitalism where production is driven by the desire for profit no matter what the cost to humanity or the planet? Is this not the point at which the Green and the Red meet? The rise of gigantic, corporate capitalism, already a reality in Morris’s time has now reached its nadir and we can see the appalling result now spread across the planet, enslaving all in its merciless grip and threatening the existence of humanity. After a century and a half of failed struggle by the Left in all its forms, it has fallen belatedly to a largely non-political opposition to point the way forward, the Greens, thus the question still remains: how to join these two strands of thinking to bring about a Socialist Revolution? I contend that the seeds are already present albeit in a fragmented and depoliticized form much of it resembling Morris’s analysis that is to say, a nostalgic desire for the past visualized as some kind of rural idyll. Brit television is full of programmes that exploit this desire for a simpler, less stressful and sustainable life, clearly reflecting a society whose inhabitants are unhappy and unfulfilled by a life ruled by consumption and enslaved by debt to the banks. Even in Morris’s time the battle between Reform and Revolution had been fought and won by the Reformist wing of the left, personified to this day by the Labour Party and the reformist trade unions. The argument, that Reform would lead to the evolution of capitalism into something resembling socialism has obviously failed, indeed we have gone backwards, back to a time of rapacious and piratical imperialism that has more in common with the 19th century than the 21st. Now would seem to be the right time to reinvent Morris’s vision to bring about an ‘Epoch of Rest’ from the enslavement of corporate capitalism. Can it be done? Of course it can. Today we possess an understanding of Nature and its interconnectedness that Morris would have immediately recognized but just as Morris understood more than one hundred and twenty years ago, it requires a Socialist Revolution to realize his vision. For proof of the rightness of News From Nowhere we need only look at what Cuba is doing today, albeit because it was forced to following the collapse of Soviet Union. Organic, urban agriculture that is able to feed to the entire population with wholesome, natural foods; an education system geared toward the development of each and every individual’s needs; a health system second to none on the planet. If Cuba can do it, in spite of forty-plus years of embargo, sabotage and isolation by its arch-enemy the US, think what a country like the UK could do! We have a highly educated population, vast wealth in the form of a developed infrastructure, a sophisticated communications network and above all a growing desire for change. 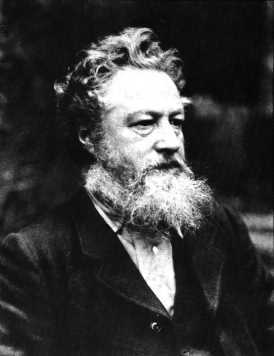 For more on William Morris see The Biographies of William Morris on the William Morris Website.